For the Dogon, music is an essential part of life. Traditionally, it is used to usher the dead into the spirit world, during a special celebration honoring their departed spirits. This event, called a dama, is held roughly every four years. Men wearing spectacular masks representative of life forms ranging from hunters to monkeys and birds, dance to summon the Dogon ancestors. When the dama's driving rhythms have lulled, the spirits of the dead are at peace and the Dogon community can return to its usual rhythm of life. The kanaga mask represents a bird and is one of the most important masks used in the dama, the Dogon ceremony honoring the spirits of the dead. 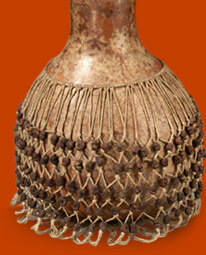 The kanaga's dance represents the galaxy orbiting, an action devised by the Dogon creator, Amma. Several feet high, the sirige mask's dance symbolizes the rotation of the earth on its axis. It makes its entrance at the end of a dama, the Dogon ceremony honoring the dead. The sirige mask wearer stands in one spot and spins rapidly around to represent the circular movement of the galaxy and the stars. The sirige mask is often called the house mask, since each time it is used its height increases with the addition of an additional layer, or house. The satimbe mask represents a woman who used fibers from the red hibiscus plant to disguise herself and frighten Dogon men. In return, the men confiscated the woman's fibers. The woman was given the title "Sister of the Masks" or Satimbe, a reference to the male-dominated Dogon secret society of mask wearers. This mask is the only woman represented at a dama.